Social Stories can play an essential role in enhancing communication and bringing down anxiety among individuals with ASD. Over the past two decades, Social Stories, and their innovator, Carol Gray, have earned the respect of parents, professionals, and people with autism, for their utility in providing clear explanations of what is often a confusing social world. 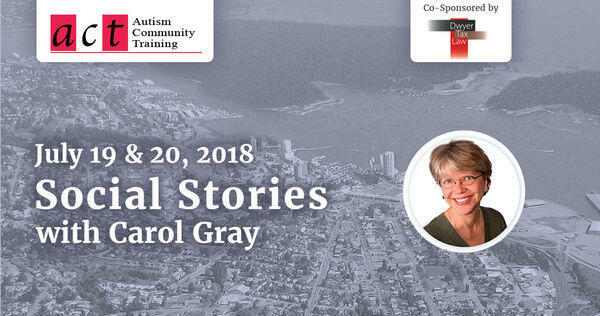 This Social Stories 10.2 workshop, led by Carol Gray, will devote two full days to the art and science of Social Stories, with the focus on practicing skills and discussing new strategies. Join us at the beautiful Vancouver Island Conference Centre, to polish your Social Stories skills or discover the versatility of this instructional strategy for the first time. No previous experience of Social Stories is required. Learning how to research, develop, and implement a genuine Social Story is critical to their effectiveness, safety, and integrity. While one of the most popular evidence-based instructional strategies for learners with autism, Social Stories are also frequently misused. This workshop will define clearly the criteria for what a Social Story is and how you can develop them to build positive social concepts and skills in an individually tailored, unassuming, and supportive learning context. Participants will receive an Advanced Social Story Certificate at the conclusion of the workshop. This entry was posted on July 19, 2018 by Stephanie Porter.